The school is a happy working community in which academic aims go hand in hand with an ethos of care and respect for each other as well as for the wider community and environment. Our overall aim is to provide an education which will enable all children to gain the skills and attitudes necessary to meet their potential and allow them to successfully pursue their chosen avenues through higher education and life itself. 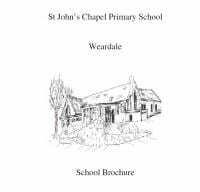 I believe that Weardale is a special place in which to bring up children and that the school should interact with the community in as many ways as possible. I therefore hope that you will be able to play an active part in the life of the school. Despite the necessary security requirements we endeavour to make the school as welcoming as possible and look forward to meeting you. If you require further information regarding any of the items on our website please contact the school and we will do out best to help. Our School Brochure is available in PDF Format and can be viewed or downloaded from our website by clicking the link below.